Tucker Toys E-Z Grip Ball is perfect for all ages, but especially perfect for young children or special needs children learning to grip a ball. Each ball has a strong textured outer web made of a strong rubber that's easy to grip with one hand, even for Ariel at 20 months old. Inside is a durable, inflatable inner ball. The combination allows kids to get a great grip and hold on tight yet when it's thrown it can bounce high or be caught easily. These balls work great in any condition, even sand, mud and water. We were even able to get our football to "skip" across the entire length of water in a pool. Elijah at almost 8 years old loves playing catch with me and it's an instant favorite ball. Each one comes in a great eye catching color combination that is easy to see even outside; ours came in the black and yellow color variation and we have no problem seeing it in the grass. 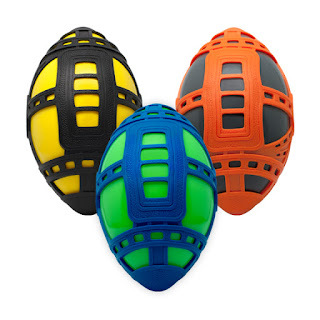 We love our E-Z Grip Football so far and know you will love their balls too! "E-Z Grip Play Ball is the ultimate ball offering high bounce and super grip. It features a soft but tough outer web that makes catching it easy for any hands. Its high bounce delivers on any surface from grass to a street, even sand, and water! The durable inner ball and E-Z Grip’s outer web deliver unmatched performance for playing everything from catch to dodgeball to kickball and more. The E-Z Grip Ball has received Best of Show – Toy Fair NY, National Parenting Center Seal of Approval, Mom’s Choice Gold Award, the Tillywig Top Fun Award and Special Needs Approval from Lekotek/AblePlay!" "E-Z Grip Junior packs endless possibilities into a 4.25-inch ball! It fits in any backpack, bookbag or purse and can bounce on any surface wherever you take it." "E-Z Grip Soccer Ball is a dream on the field and a sure thing for goalies. The super bounce makes the ball travel down the field like it was being chased! For goalies, catching the soccer ball with the special high-grip outer web means saving the game!"